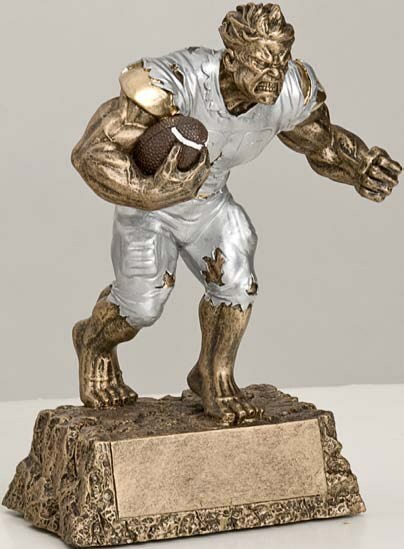 6 3/4" Monster Football Resin Figure. Figure features gold and silver accents and a gold base. Price includes engraving on 7/8" X 2 1/2" engraving plate. Maximum 50 characters /3 lines of engraving. Price includes constant copy engraving. Add $ .50 per plaque for each name/line change. If your order is for more than 1 figure, please order the amount you need and then e-mail the engraving (i.e. team roster) to: sales@victoryawardsandtrophies.com . Please make sure the roster is FIRST then LAST name. We accept Word documents, Excel spread sheets or you can just put it into the e-mail. Please specify positions. RESIN FIGURES come in boxes of 12 pieces. If you order more than 12 pieces, you will receive more than 1 box of figures. Refer to the UPS map using zip code 28403 for regular ground shipping days to your area.